Parya Saberi, PharmD, MAS, AAHIVP, is an Assistant Professor in the Department of Medicine at the University of California, San Francisco’s Center for AIDS Prevention Studies. Recognize important drug-drug interactions between medications used for HIV and Hepatitis C treatment. Examine options for avoiding or minimizing drug-drug interactions. Identify resources to obtain up-to-date drug information on HIV and Hepatitis C drug-drug interactions. Parya Saberi, PharmD, MAS, AAHIVP – no relevant financial relationships no disclose. VA HCV website: http:// www.hepatitis.va.gov/provider/index.asp ? 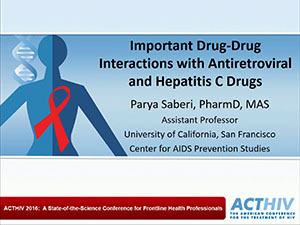 Parya Saberi, PharmD, MAS, AAHIVP, is an Assistant Professor in the Department of Medicine at the University of California, San Francisco’s Center for AIDS Prevention Studies. Her primary practice site is at San Francisco General Hospital where she is an HIV Clinical Pharmacist at Ward 86 (Positive Health Program).